If you have any young children who love numbers, this is definitely a children’s book they should read. 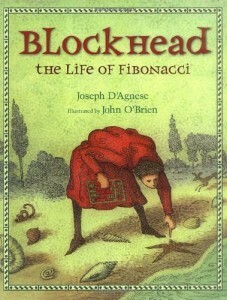 It’s a superb biography written at an easy level, about Fibonacci, the great Italian mathematician whose discoveries about numbers are taught world-wide. I love the fact that the illustrations support the understanding of his Fibonacci series, as well as presenting his life story. While I am sure there are biographies for older readers, there is something special about introducing young people, age six to nine, to this brilliant mathematician. This children’s book comes in a variety of editions. There are hardback copies on Amazon, as well as translated versions in Japanese, Korean, Spanish, and Catalan. However, the most economical version of this children’s book can be found on the Scholastic website, where they offer a paperback version at a very economical price. I could also see this book being part of a second or third grade class library, to appeal to those children who might be struggling to read, but who love math. It’s great to find math books for kids like that, so that they can use their interest to inspire reading. I am looking forward to my eight-year-old grandson’s review of this one!